There’s a standard speech I give when people ask me about the Middle East, and in particular the Arab-Israeli conflict. I have shied away from writing on the subject in this blog for some time — it often seems that all the arguments have already been made, and every discussion devolves into a screaming match that brings out the worst of the blogosphere, which is tiresome. And yet, the mainstream media constantly tells us or implies that the “Arab-Jewish” conflict is an age-old one. Not only is this inaccurate — it is a 20th century phenomenon — it’s a confusion of terms: Arab and Jewish are not exclusive categories. They are used to describe ethnicity and, in the case of the latter, ethnicity and/or religion that may overlap with many different ethnicities. One may take issue with the use of the terms in one way or another, but the thing is, we continue to have evidence that one may be both Arab and Jewish. Take Israeli-Yemeni singer Ravid Kahalani, whose music I just found out about. I could write a whole essay about what I like about Kahalani’s music, which a friend introduced me to a couple of days ago. There’s the lovely pentatonic scale; the combination of oud and darbakeh (Arabic drum); the evidence in his voice of his background as a synagogue cantor; that rolling trance-like feel to his rhythms that reminds me of Ali Farka Touré and makes me picture the desert. His album is called Yemen Blues. Anyway. To bring my speech back to current events. I woke today to images of unarmed marchers setting out from Lebanon, Syria, Gaza and the West Bank, attempting to to cross the border into Israel. Troops of the latter opened fire, killing at least a dozen and injuring scores. Many of the protestors were reportedly Palestinian refugees — there are nearly 5 million of them in Jordan, Lebanon, Syria and the Palestinian territories. In my standard speech, I make my point about identity because I think, however one evaluates incidents such as these, it is important to remember that they are a result of political grievances that have their roots in the events of the last 100 years. (Specifically, many of those Palestinian refugees continue to carry the keys to the homes their families were kicked out of 63 years ago when Europeans escaping persecution wanted a place to live.) Age-old religious animosity does not really factor in. I certainly do not have Kahalani’s permission to entangle his music in this argument, but as I sit back and listen to him sing “Um min al Yaman” (Arabic for Mother is from Yemen), I can’t help thinking — and hoping — that alive out there still, is another vision for the Middle East. More Christians are fleeing Iraq in response to targeted violence, the New York Times reported yesterday. Every time I read about this or other ethnic exoduses in the Middle East, I wince a little thinking how these once-pluralistic countries are being inexorably pushed toward homogeneity. A good scholar of Middle Eastern history knows how factually wrong it is when Americans shrug their shoulders and say, “these groups have been at each other’s throats for thousands of years.” In Iraq and Syria, that simply wasn’t true (though societies weren’t harmonious Utopias either). But for how things are going now, it might as well have been. In 2006, my mom and I confronted this in a far more acute way, when she visited me in Damascus, where I was living. On a field trip to an ancient Christian shrine, we were forced to confront this aspect of the war in Iraq firsthand, as we listened to the tearful admonishments of a survivor — a survivor of our American war. My mom wrote a letter to then-President Bush in response to the experience. Reading the Times article, I feel like it is still relevant, if for no other reason than to remind us of how our country will long be tied to the experiences of Iraqis. I got her permission to post it here, in a slightly trimmed-down form. I was recently in Damascus, Syria and visited a place that I thought you would find moving. It is located within the walls of the old city, reputed to be the oldest continually inhabited city in the world. To find this place you must enter through one of the many gates that were built into this wall by the city’s various rulers, some by the Romans more than 2,000 years ago. One hundred years ago these gates were all locked at sunset, but today you may enter freely at any time. Find the gate called Bab Touma and enter on foot, leaving behind the chaos that characterizes modern Damascus. A sense of timelessness unfolds as you follow curving passageways formed by the mud brick walls of houses and shops on all sides. Looking overhead you will see grapevine-draped balconies that nearly touch each other from opposite sides of the lane. Over the centuries people have sat in their houses and passed tea back and forth across the lanes and into each others’ homes while they conversed and gossiped, escaping the midday heat. You will almost certainly hear the call to prayer which flows and drifts through the old city, which is filled with mosques. But if you look closer, you will notice that around you are many churches and small shrines set into alcoves that contain Christian icons with Arabic script describing what the icons represent. And then you will realize that you are in the Christian Quarter of old Damascus—Bab Touma. If you continue toward Straight Street and Bab Sharqi–the Eastern Gate–you may see, at the edge of a small square, the entrance to a small chapel, called Saint Ananias Church. This location is described in the New Testament of the Bible. Here is the story of Saul who, entering Damascus, fell from his horse and became blind. For three days he lay blind and without food until a Syrian named Ananias found him, converted him to Christianity, and cured him of his blindness. Thus began the life of St. Paul, who changed his name upon conversion and became a major disciple of Jesus. You must be familiar with this story—every Christian knows it—but I wonder if you know that it happened in Damascus? If you enter the low doorway as I did you will find a cave-like chapel built into the wall of the ancient city. The stones laid down by the Romans were incorporated into a small altar at one end. 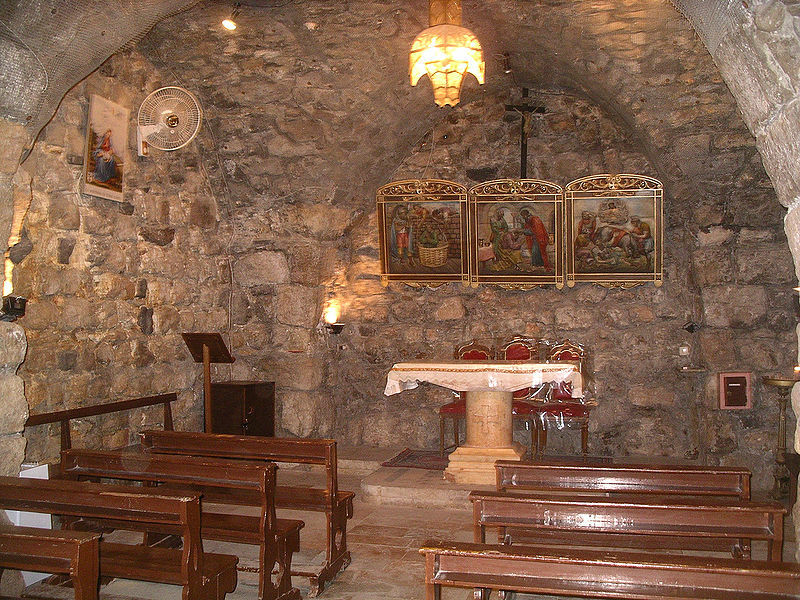 To the side is an even smaller chapel with plaques showing the various stages of Saul’s conversion. The last plaque shows Paul being lowered in a basket out of a window in the ancient wall. Indeed, the plaques show what happened in this place nearly 2,000 years ago. In case my description has not allowed you to visualize the place, I am including a photograph of it. Once inside the church, I recalled this story of Saul from my long ago childhood, when Damascus was only an exotic, storied, and distant place. This is indeed a place for contemplation of history and man’s place within it. A few minutes after I entered I was approached by a woman, dressed in a black coat and wearing a black head covering. Although her hair was concealed, I could see that she was a middle-aged woman whose large black eyes were surrounded by lines of pain and grief. Her two daughters were at her side and they wandered away, with embarrassment as teenagers will do, as she spoke to me. “Yes,” I spoke knowing that it is unusual to encounter an American in Syria, yet she could recognize me. “Please, tell your Mr. President Bush that he must stop making the war on Iraq.” Her English was rough yet she was speaking quickly, without hesitation, straight from the heart. “He is destroy our country, he kills the people, our homes are gone forever. And why? Why?” Her eyes pleaded with me for explanation. My son stood beside me and we found ourselves unable to say anything. How could I say that I opposed this war from the beginning? How could I comment that I had marked every anniversary of the start of the war with a peace parade pleading for its end? For what would this mean to a woman who had lost her husband, and her son? And her center—her very home? She asked me to tell my President to stop making war on her country. And so I am. And so I do. LGD Note: I reported this piece back in October and wrote it in November for a class at Columbia, with the intention of publishing it on a foreign affairs-concerned website. At the time, the handful of advocates for a better U.S. policy toward Syria were sounding optimistic. Then came the U.S. attack on the village of Sukkariyyeh in eastern Syria, which brought relations between the two countries to an all-time low. It also complicated my story in a way that I couldn’t untangle during midterms. I offer the piece here with the caveat that all comments were obtained back in October before the attack, and long before the Gaza war. But I think there is some interesting food from thought here that is relevant despite all the things that happened since I reported it. What kind of change will Obama bring to our policy with this overly maligned country? In response to Sunday’s U.S. attack on Syrian soil (which, by the way, Baghdad has condemned), Damascus has closed the American primary school and the American cultural center, according to Al-Jazeera. These are two of the remaining positive U.S. presences in Syria. It’s a shame, but a reaction like this was certainly expected. I guess those in Washington who made the decision to go in simply do not care. I wonder how far back our relations with Syria have been set. I’ve poured a lot of energy into trying to change the perceptions of the Americans I know toward Syria. High profile activists have been working step-by-step for years, and have seen painstaking progress. I guess as long as W is in power it doesn’t make a damn bit of difference. Have our hopes for an evolution to peace been completely dashed? I can’t wait for a new White House. Last Friday evening I leave late with my friend Ghaith for Homs, his home city, two hours north of Damascus. He is a little disappointed – he would have liked to leave earlier, because he wanted to show me the countryside and a village. But I had meetings with other friends all day, and couldn’t get away. Ghaith is like all my Syrian friends in that he is desirous of my time and utterly generous at the same moment, demanding a lot from me and giving me even more. There is no reasonable request to which he would say no. He and others try to give me money, insist I eat from their refrigerators when they had little, use their cell phones, act as if they were personally insulted when I tell them how a cab driver overcharged me. Ghaith complains about the condition of Christians in the Arab world. He also clearly loves Arab cultures. He is enthralled with old poetry and romantic songs. Arabic is his mother tongue, and the only language he speaks fluently. We get into Homs by 10:30, in time to eat dinner with Ghaith’s family. They are barbecuing on the tiny balcony of their small apartment in a nondescript block of housing somewhere in the sleepy city. The breeze is blowing, a fact about which Homsis seem proud. I sit on the couch and watch Turkish soaps dubbed into easy Arabic with his sister. Every so often Ghaith taps on the glass sliding doors and insists that I eat a succulent morsel from the kebabs. We eat dinner with glasses of araq on the rocks. Ghaith’s father, a craggy man with a prominent pot belly, gnarled strong limbs and a bottlebrush mustache, tries to crack jokes with me in broken English, which makes the Arabic in between that much harder to understand. Ghaith’s mother, a stout, dark-haired, doting woman, keeps emerging with more plates of skewered meat, onion and tomatoes. Slight beads of perspiration form on her brow. Afterward, while the women do all the cleaning up (I try to insist on helping, an idea greeted as ridiculous for the double reason of me being a male and a guest), the father regales me with tales of his time in the United States, where he spent several multi-year periods. “You can’t say that, Dad,” Ghaith says, knowing I am offended. The father says America is beautiful, wallahi al-azeem. He can’t go back now because he overstayed his last visa. Ghaith’s father’s physique and presence would seem to be the result of a peculiar combination of habits. He smokes two packs a day and generally does not eat vegetables if they are not accompanied by meat. He also rides his bicycle 10 kilometers a day to and from work. Then, in the dialect of the Bedouin, he can recite beautiful poems called Baghdadis. His family is from eastern Homs governorate, on the edge of the desert. When he was a child – and the family had already moved to the city of Homs – bards would sing these songs, and he would memorize them. The poems have several lines ending in a word that sounds the same but has a different meaning in each case. They deliver an emotional punch even when I have no idea what they are about. I imagine the father as a small Christian boy at the feet of a roaming bard in a dimly lit village, hanging on every word, as his whole family and I are doing now. No one besides the mother understands the Bedouin dialect in which the father sings the poems, and he must explain them. The foreign words bring to mind the vastness of a dark desert, a place where the stars are the brightest thing at night, and life’s longing is undisguised. The songs are about lost love. Back in his room in Damascus, Ghaith plays for me Bedouin songs that he has saved on his mobile phone. “You understand that one?” he grins. “That one’s impossible. The singer wails and repeats the line. “He’s saying that when your mother sees your silhouette in the desert from afar, she cries from camp to greet you. She doesn’t care about how you look or what you have done. “But when the girl sees your silhouette in the desert, she tries to reckon your appearance before she rises to greet you. What does the suitor do in the end? “Ha, he stays with his mother,” Ghaith says. He clicks off his phone and reaches for hot water, to fill our glasses of yerba mate. Back in Beirut after a week in Syria, I already feel far away from Cham, which is a city that raised me, in a way. Being in Damascus was like visiting the city of one’s childhood in a dream. Everything looks normal at first, but then there are bizarre differences from real life — exaggerations, unmarked absences — that creep up on you until you realize it is not really the same place at all. The changes stem from the fact that Syria is trying to open up economically and the socialist sheen is disappearing. In that sense, its society is fading into a plain old dichotomy between rich elites and poor people. People say that the middle class is dwindling. A snapshot: Damascus has new, green public buses and people have bought new cars by the thousands — Hyundai, Skoda, Peugot, etc. — so it no longer has a Cuba-of-the-Middle-East feel. The number of restaurants and hotels in the old city appears to have about doubled. The government has torn up parts of the old city for refurbishment. There are more beggars on the street — there were once hardly any. Youtube and Facebook are officially blocked, and many of the internet cafes appear to have shuttered, though I couldn’t say why. Foreign companies like KFC are more prominent, and there is a big, American-style mall in Kaffar Sousseh. Average Syrians aren’t thrilled with the economic changes. They say the cost of living has shot up, and salaries haven’t. The friend I stayed with in a crumbling, mildewed, shared room in a poorer Christian neighborhood is experiencing the economic climate more directly. With a college degree, he has a “good-paying” job at a bank that is working him hard. The pay is about $500 a month. Enough to get by, and have the occasional indulgence at a cafe. But hardly enough to build a future. Of course, I love Syria dearly, and I think it has been much maligned — and subjected to ridiculous measures, like the prohibition by the United States of shopping at the airport’s duty-free — while the greater misdeeds of other countries (ahem) go completely ignored. I also understand the need for economic reforms. I hope for a bigger Syrian role in international affairs, for its prosperity as a country, and deeper acknowledgment of the burdens it has had to bear as a result of the war in Iraq and the generosity it has shown to refugees. I just don’t think I’m hearing much support from among Syrians for the direction that’s been chosen. In any case, I won’t forget the day I came into town: flying down out of the mountains on a Sunday morning in the July sun, the city sparkling, green and peaceful below, joy rushing inside me as I recited the neighborhoods through which my taxi passed, just to feel their names on my tongue. A brief homecoming.